Income Works, LLC, implements the strategy of covered call writing for investment income whose objective is to provide a solution for individuals and businesses seeking "income that outpaces expenses." An independent financial services company, Income Works sets its unique income strategy apart from most through active management and more than 25 years of experience. Income Works' strategy for income provides a solution to each client's respective goal—whether you are retired, planning to retire, or still accumulating wealth—and it reinforces our commitment of enhancing the personal wealth of our clients. Supporting documentation about option trading, the covered call writing program, option expertise, recommendations, or other technical data are available upon request from Richard Baker of Income Works, LLC. 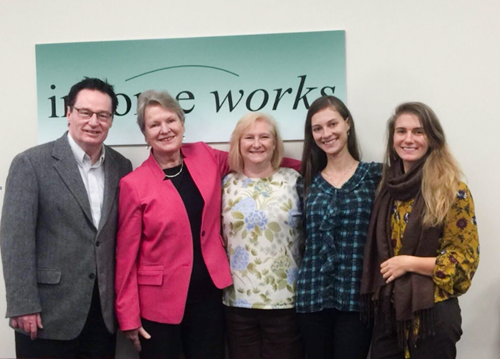 We are pleased and honored to partner with Catherine McEnroe who came for a visit last month. This communication is strictly intended for individuals residing in the states of AZ, CA, CO, CT, FL, GA, IA, IN, MA, MD, ME, MI, NC, NH, NJ, NY, OH, TX, UT, VA, VT, WA, WI. No offers may be made or accepted from any resident outside these states due to various state regulations and registration requirements regarding investment products and services. Investments are not FDIC- or NCUA-insured, are not guaranteed by a bank/financial institution, and are subject to risks, including possible loss of the principal invested. Securities and advisory services offered through Commonwealth Financial Network®, Member FINRA/SIPC, a Registered Investment Adviser.